List five core principles of inclusive leadership. Our job as leaders is to create an environment where everyone can do the best work of their careers—regardless of their race, ethnicity, gender identity, age, religion, ability, or sexual orientation. A successful inclusive leader understands and elevates their team’s unique strengths, uses their platforms to advocate for their employees, and fosters an environment where everyone feels empowered to be their full, authentic selves. From the boardroom to the front lines, you have the opportunity to lead with inclusion and impact positive change. This can manifest in the workplace as speaking up for someone who was interrupted in a meeting, creating space for difficult conversations, sharing your own Equality journey, or even changing the monthly team happy hours to a lunch so that it’s easier for caretakers to join. Each seemingly small act of inclusion creates a ripple effect that can, over time, transform the culture of your team and company. Diversity is the presence of people from many different backgrounds and identities. Inclusion is when every single person in the community is valued, heard, respected, empowered, and feels a true sense of belonging. Only when you combine the two do you foster a true culture of Equality. As you strive to create a workplace that reflects your diverse customers and surrounding communities, it’s essential for your work group to foster an environment that is both diverse and inclusive and where everybody can thrive. Watch this video of Salesforce employees, partners, and customers sharing why a feeling of belonging is so important and how we can all work together to create a more equal environment for all. Everyone has a role to play in creating a more equal workplace—Inclusion begins with you. 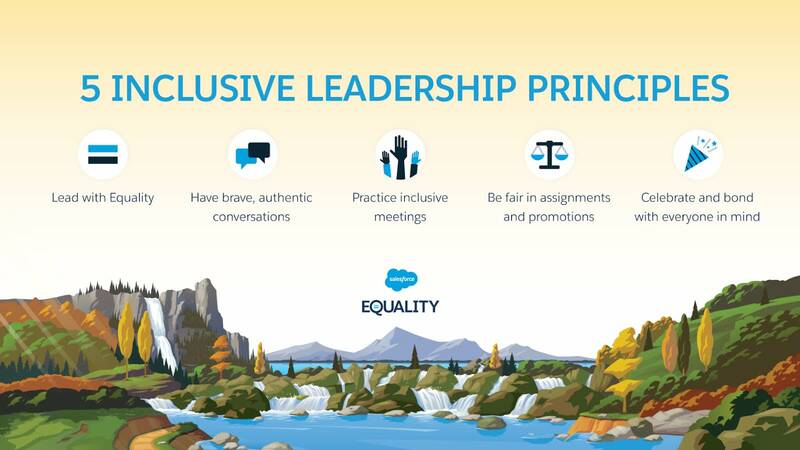 Here are the five inclusive leadership principles we are driving at Salesforce. This module helps you better understand the power of inclusive leadership and how to create a culture of Equality within your company’s four walls and beyond.